Grandmother of Twins Discounts Apply ! Grandmother of Twins is very popular with all the Grandma's of twins that we know...including the ones that we're related to. 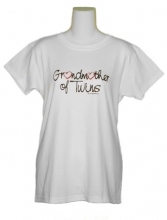 They love being a very special Grandmother of very special twins. Available in white or gray.